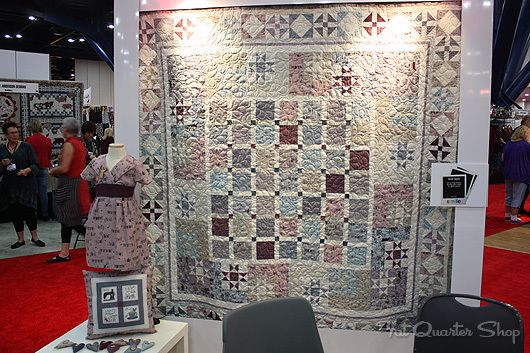 Another day at Quilt Market has come and gone! 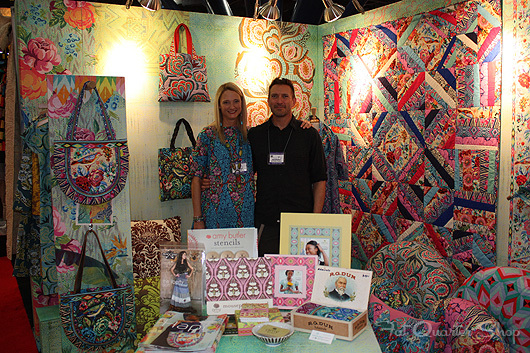 We are having so much fun here in Houston for International Quilt Market 2013. 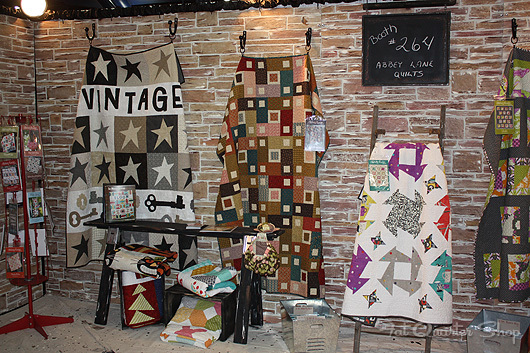 Seeing the booths, hanging with our quilty friends, and getting very inspired! Want to see a peek? 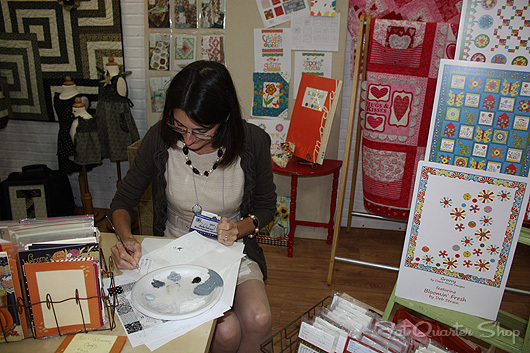 Keep reading for more photos from Quilt Market 2013 and be sure to check out our Twitter, Facebook, YouTube channel, and Flickr for more behind-the-scenes updates from the show. Zen Chic showing off the chic and modern Sphere collection in the Moda booth! Deb Strain doing a painting demonstrating in the Moda booth. 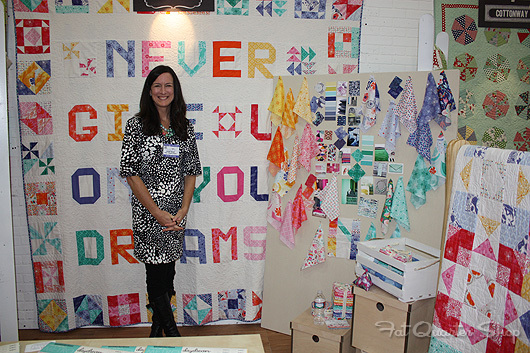 Kate Spain and her 'Never Give Up On Your Dreams' quilt featuring Daydreams. 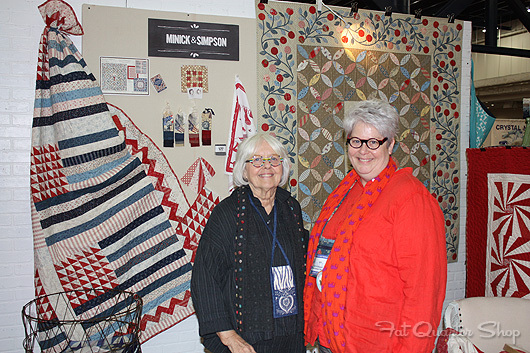 Polly and Laurie of Minick and Simpson give us another gorgeous red and blue collection, Grant Park! 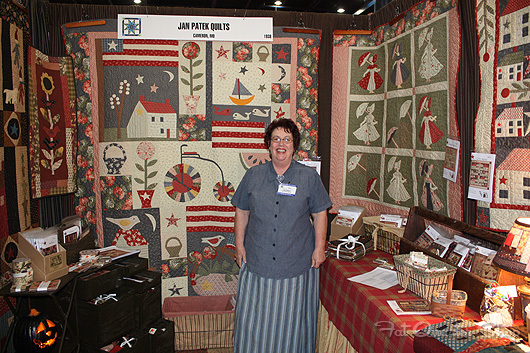 Jan Patek in her booth with quilts made with Front Porch! 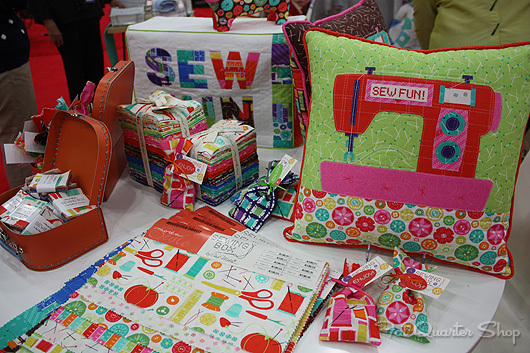 Sewing is definitely fun when you sew with Gina Martin's Sewing Box! All ducks are following along with American Jane's Ducks in a Row! The stunning Mastering Miniatures Block of the Month hanging in the Marcus Brothers booth. 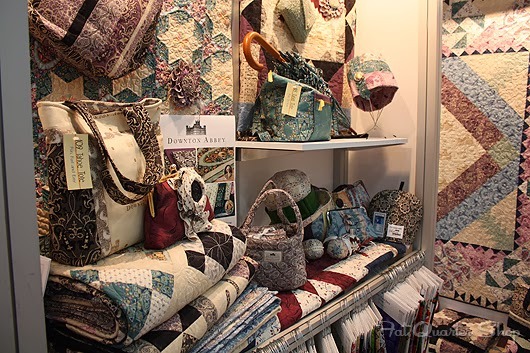 Stunning projects made with Downton Abbey fabric by Andover. We can not wait for this collection to arrive! 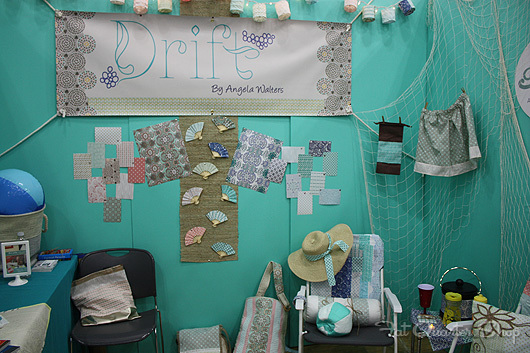 Calm and soothing Drift collection by Angela Walters for Art Gallery Fabrics. 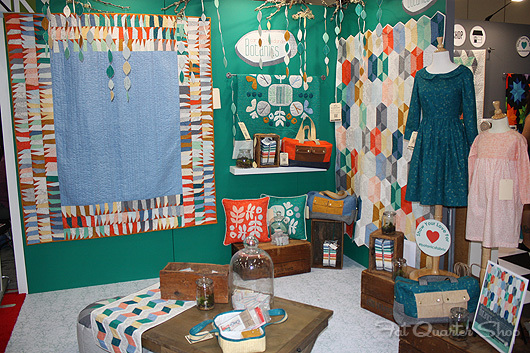 Calming and cool colors in the new Sausalito Cottage collection by Holly Holderman for LakeHouse Dry Goods! 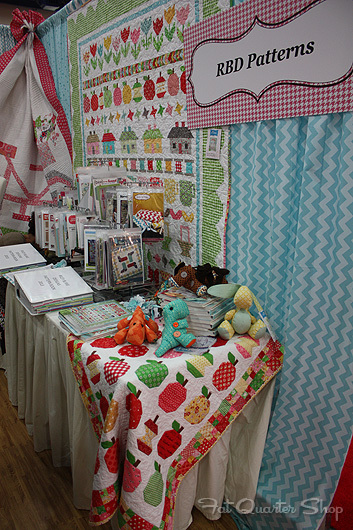 Lori Holt's Quilty Fun book on display in the Riley Blake booth! 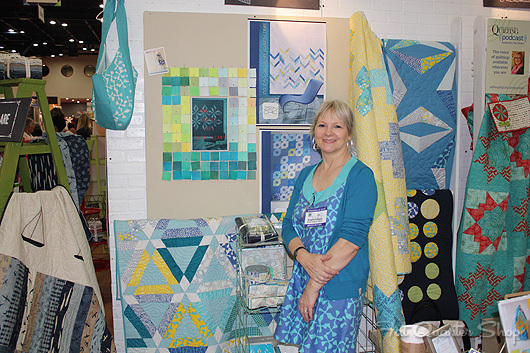 Julie Herman and her Park Bench Block of the Month in the Robert Kaufman booth! The cute Butler couple in Amy Butler's Hapi booth! 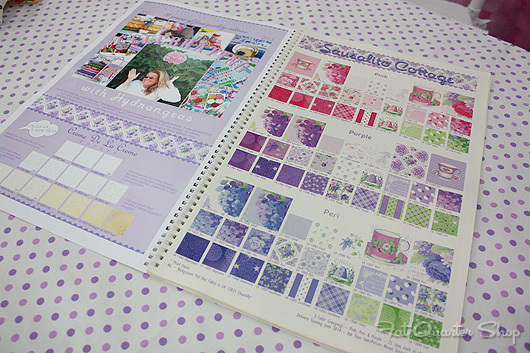 Pretty Quilter's Garden projects by Lynette Anderson for RJR Fabrics. 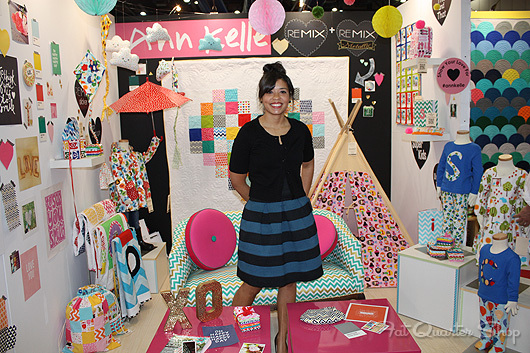 Ann Kelle in her charming booth! So much color! So much creativity in the Robert Kaufman booth! Botanics by Carolyn Friedlander is definitely a favorite! 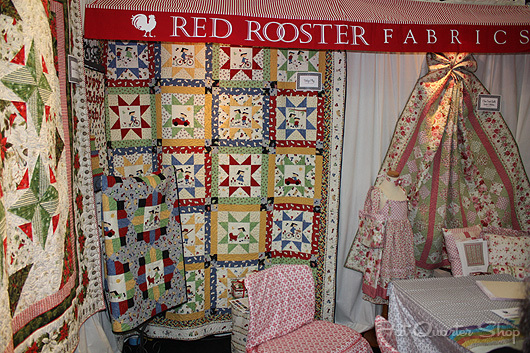 The Vintage Play quilt by Suzn Quilts in the Red Rooster booth. Love this quilt? It will be a kit at FQS! 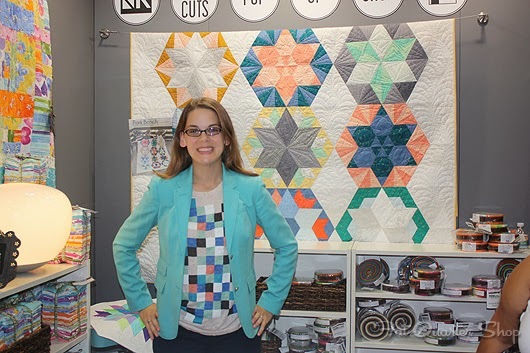 The regal Affairs of the Heart Quilt Kit really shows off the Jinny Beyer palette! Trendy, fresh and organic! 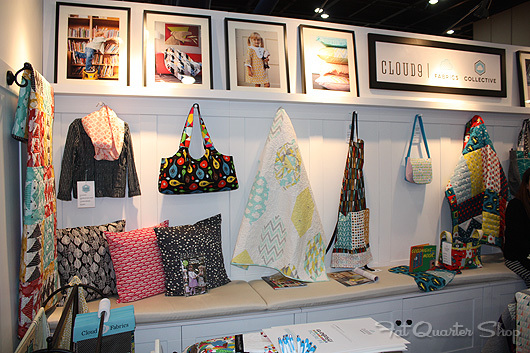 It can't get much better than Cloud9 Fabrics! 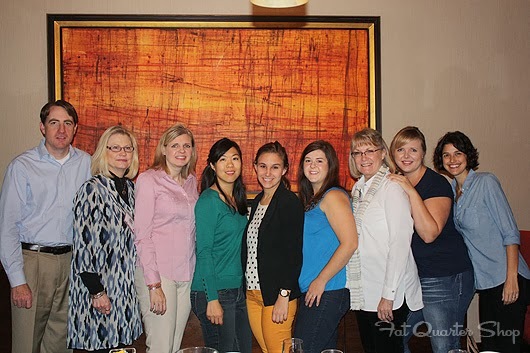 The Abbey Lane ladies never disappoint! We love all of their new groovy quilts! Spidey senses! 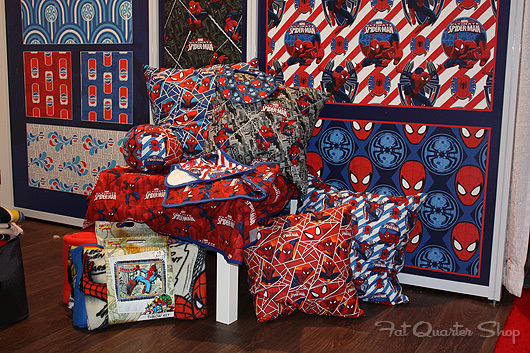 Fun Spider-man prints in the Camelot Cottons booth! 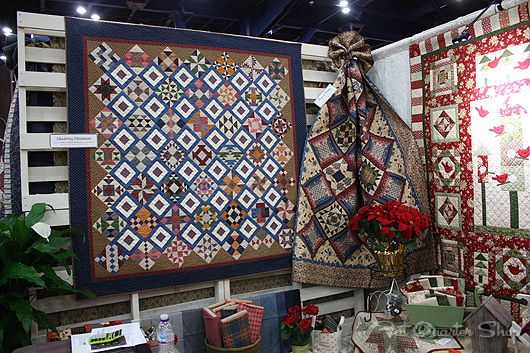 Quilt Market is full of book signings, and we have plenty of books to bring back to Austin! We are celebrating all of the fabulous new books with a big giveaway! 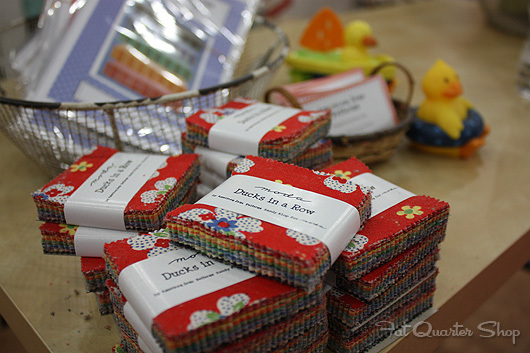 We are giving away new titles like Modern Bee, Big City Bags, Modern One-Block Quilts, & Quilty Fun! 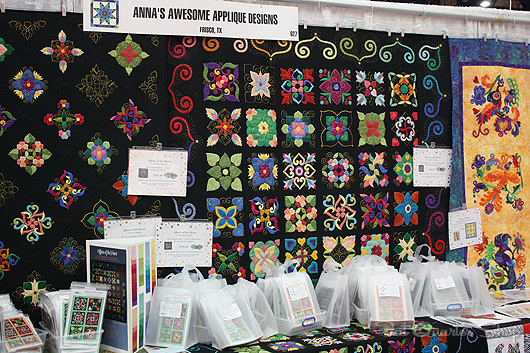 Leave a comment below letting us know you're favorite thing from our Quilt Market recaps for a chance to win one of THREE sets of books! Winners wlil be chosen and announced on Tuesday, October 29, 2013. Good luck!